Thank you for taking the time to check out the campaign for ‘Dreamcast: Year One’, an unofficial look at the first year of Sega’s final home console with a decidedly British slant. After backing Sandeep Rai’s excellent ‘PlayStation Vita: Year One’ project last year, I was reminded of the short lifespan of my own favourite console, the Dreamcast. It was my first love (as far as game consoles go) and has gained a massive cult following in the years since its discontinuation on March 31st 2001. However, this book focusses on the conception, launch and first year on the market for Sega’s white box. This is the first in what I hope to be a trilogy of releases to give fans both old and new a history of the console. ‘Year One’ will therefore be split into three sections. 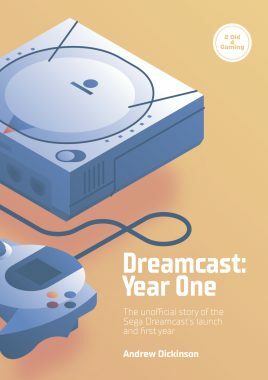 ‘The Story’ will consist of several chapters exploring how the Dreamcast was originally conceived, it’s launches around the world, and how it fared once on store shelves. We’ll therefore be examining the console historically from the launch of the Saturn in 1994 up until March 31st 2000. 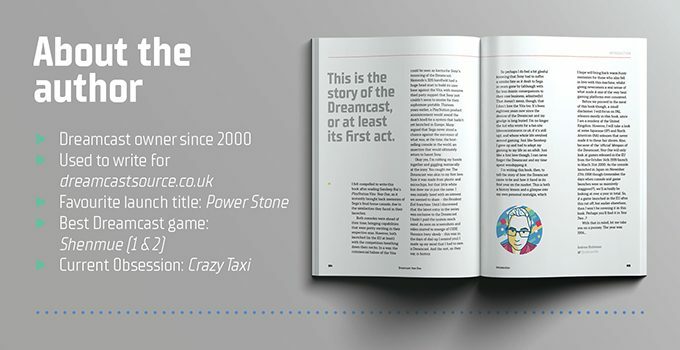 We also have an ‘Interview’ section, featuring interviews with people prominent on the Dreamcast scene in the UK both then and now. 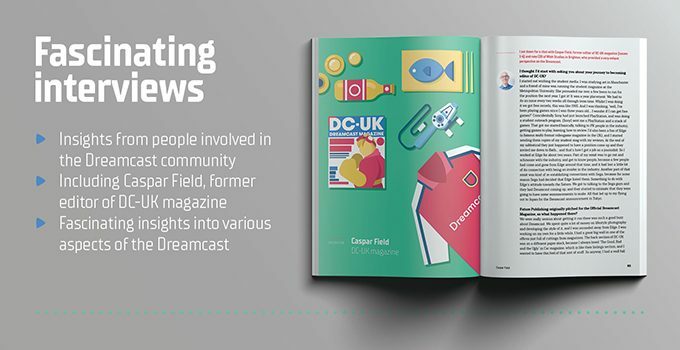 We spoke with Caspar Field, former editor of DC-UK magazine for a first hand account of the Dreamcast launch from an insider perspective. We also quizzed Tom Charnock, founder of ‘The Dreamcast Junkyard’, currently the biggest online community of Dreamcast enthusiasts, about his experiences with the Dreamcast as a consumer in the nineties. In update number one we also unveiled that the former president for Sega of America, Bernie Stolar, would be getting the interview treatment, and in update number five we revealed former Official Dreamcast Magazine UK reviews/deputy editor Ed Lomas would round out our interviewees. Finally we have our ‘Library’ section which contains retrospectives of key games from the period we’re covering, focussing mainly on PAL releases. We’ll be taking the PAL release date of a game as the main one in this series, unless it was never released in the territory. There will also be a gallery with all box art for PAL releases during this time (and some NA and JP only releases) as well as a timeline with an overview of the period covered in the book. One of your favourites missing from that list? Well, we’re also offering the opportunity for twelve backers to write their own 100 word retrospective for any release in our time frame not already covered above! A list of these games can be found here. More about this pledge level below! Tell us about yourself and experiences. I’m Andrew Dickinson, an avid gamer, Dreamcast fan and lover of cats. I was going to add on a bunch more stuff but I felt that would be far too Daenerys! I’ve owned a Dreamcast since the year 2000, and was involved in writing for a Dreamcast fan site at the time it was on the market. Since then life has happened, and although I haven’t written quite so much, my writing skill has improved immeasurably! What got you into writing books about retro gaming? As I say, I wrote for a Dreamcast fan site whilst the Dreamcast was still alive, so that would have been more current gaming than retro. However, no console since then has affected me in the same way, and I have always wanted to write more about this amazing console that helped to shape the gamer I have become today. 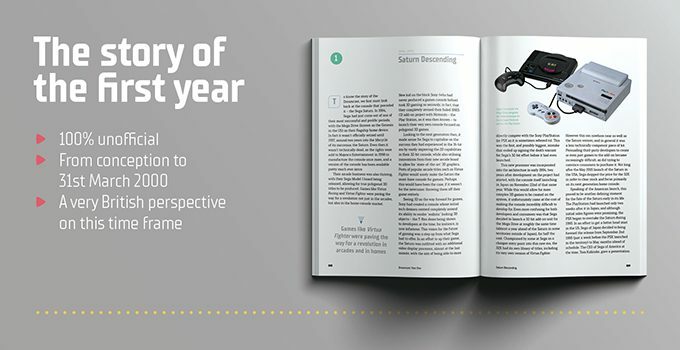 What set me on the path for ‘Dreamcast: Year One’ was actually another book funded via Kickstarter titled ‘PlayStation Vita: Year One’ by Sandeep Rai. He had created this great format to tell the story of the history of his favourite console, and I bought into it big time. Seriously, I bought like six copies of that book! 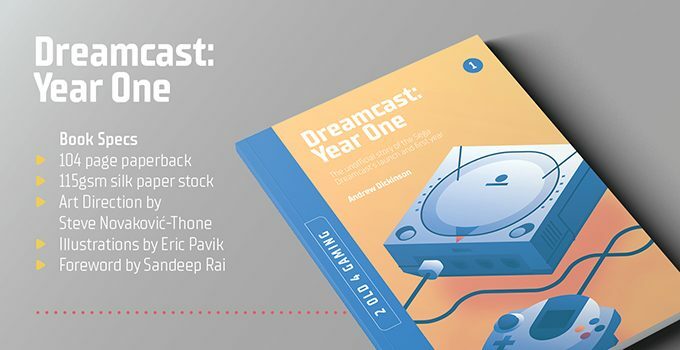 After it had released, I got chatting to Sandeep, as I could see similarities in the launches of the Vita ans the Dreamcast, and I mentioned how it’d be cool if there was a book in the same format covering the first year of the Dreamcast. He loved that idea, and told me to go for it. And that I did! How long has it taken to research for the new book? I guess you could say I have been researching since I got my Dreamcast 19 years ago! However, specific research and development for this book has taken about 7 months so far, and I’m still going. The book isn’t complete yet as I wanted to be sure that what I was doing would be of interest to people before it was done. As of right now I know that it is, because we just funded, so the work will now continue unabated! What is in the new book to get us retro fans to hand over the cash? Asking people to hand over their money in advance for something is always tricky! They’re placing their trust in you to produce something of quality, that is interesting and worthwhile. I am trying to do that for them by looking at the Dreamcast from an often neglected angle, which is that of the UK. Having been a consumer of the console in this country, and contributing to the community in my own small way at the time it was out, I wanted to look at it from a place of my own nostalgia. I know there are many DC fans here, and also in Europe and Australia (the PAL region) who probably share many of my memories. So some of the story will look specifically at the UK, and I also have interviews with three British people who have been influential on the Dreamcast scene. They are Caspar Field, former editor of DC-UK magazine, Ed Lomas, former reviews/deputy editor of The Official Dreamcast Magazine (UK) and Tom Charnock, founder of The Dreamcast Junkyard, which is currently the largest Dreamcast community out there, especially on Facebook. I’m also interviewing none other than Bernie Stolar, who was the COO and president for Sega of America during the development of the Dreamcast. He’s not British, but he is one of the guys responsible for giving us the console that I’m writing about, so it seemed right to chat with him to gain some more insight into the conception of the white box. 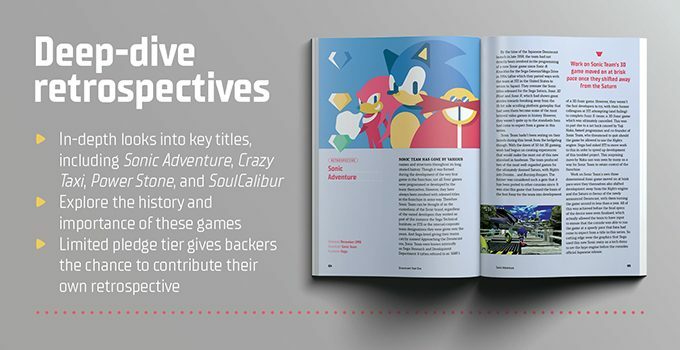 On top of that, there will be retrospectives of some of the biggest games to be released during the time frame that my book covers, so I think that all of this together makes for a book well worth any retro gamers time! If you were a Dreamcast fan from the start, a brand new fan or even if you have never played it, everyone should be able to enjoy my book, I hope! This is my very first book. I have written before, as I mentioned. The last Dreamcast article I wrote was back in 2012, for a friends now defunct blog. It was titled ‘More Than A Dream’ (which is what I have named my top pledge tier), and discussed what the Dreamcast meant not just to me, but also the gaming community overall. So I guess you could see ‘Year One’ as an extension of that article really. The first console we ever had growing up was a NES, so the first gaming experience I can remember was the first Mario game. We went on to get a SNES, and I have very fond memories of me and my brother (and sometimes my sister) playing on those consoles. I then shifted to the PlayStation where I discovered the Resident Evil series, and that is what ultimately led me to getting a Dreamcast – so I could play Resident Evil CODE: Veronica. I had an Amiga at some point, but my memory on that is hazy. As I remember it, a friend and I would use a paint program on it to design our own cars! I don’t remember much in the way of games from that system, but I absolutely played some! My favourite console is of course the Dreamcast. I don’t think anything can even come close. However, I hold a soft spot for the Gamecube, and more recently the Wii U. I’ve discussed with Sandeep what console I might cover after I’ve one all that I want to do about the Dreamcast, and I think that the Wii U would actually be perfect. A misunderstood system that had some amazing games and interesting innovations (the Game Pad) but was ultimately not as successful as people expected. This is always a hard question to answer. I would class so many as favourites. The game that made me realise the possibilities that gaming had as a source of both entertainment and storytelling was Resident Evil. I’m a horror fan anyway, and that blew me away, I had never experienced anything like it. Shenmue I & II gave me similar revelations, in that it presented a story in a way I has not expected. It wasn’t set in some fictional place, it didn’t have cartoony graphics, it wasn’t just trying to be one thing. It was this fusion of gameplay ideas blended with real life, sometimes so much real life that it could be mundane (waiting around for a particular time for an event or having to get a job to get money), that really spoke to me and escalated yet again what I thought games could be. I notice you haven’t covered Shenmue yet, so a look at that would be great. Or how about a feature on the history of the Resident Evil series?